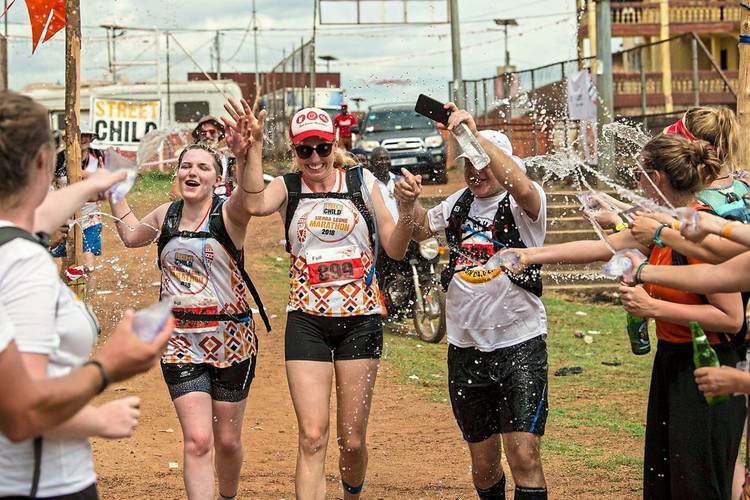 Boston, London, Sierra Leone: and for many marathon addicts, the event in the West African nation tops them all, says Sue Watt. I’d been running for an hour in an oppressive, humid 32°C along Makeni’s muddy streets, my face bright red, my legs a law unto themselves. Friendly strangers lined the route cheering me on, while children with beaming smiles ran alongside me or high-fived as I passed, shouting “Oporto,” their local slang for a white person. I should have been shattered. Instead, I had the stupidest, biggest grin across my face. This is how it feels to be part of what Running World magazine aptly calls “the craziest and most worthwhile marathon in the world”. 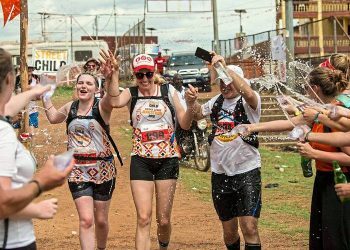 Sierra Leone might seem an unusual destination to win the 2017 “Best International Event” in the Running Awards. But it’s well deserved. 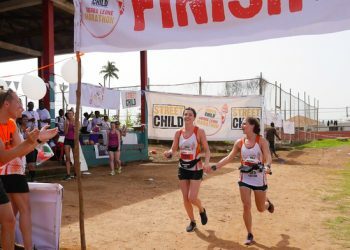 With distances of 5km, 10km (my distance), a half-marathon or the full 42km/26 miles, it’s organised by the UK charity Street Child and on May 28, 619 runners took part. All participants fundraise for Street Child’s projects across the country, projects they get to visit on a five-day package that includes food, transport and accommodation ranging from simple hostels to comfortable hotels. Just as the West African nation was recovering from the war with an improved economy and a remarkable post-conflict reconciliation, the virulent disease effectively closed the country down. Almost 4,000 people died, leaving around 12,000 orphans. Street Child’s work became even more significant, training Ebola educators and providing counselling and support to orphans stigmatised and traumatised by the disease. We spent two days visiting Street Child’s projects in the north of the country. 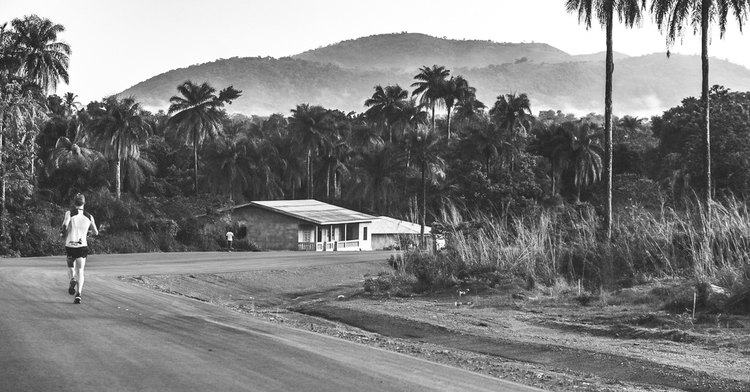 The remote Hayling Academy Primary School in Kadaimba was a three-hour drive from Makeni on bumpy orange-hued roads, passing hillsides bursting with banana plants and palms. Children in uniforms sang angelically before teachers handed them some gifts — simple, old-fashioned chalkboards. We made paper aeroplanes, blew bubbles and played football with them, revelling in their giggles. In the frenetic town of Lunsar, we visited the local market, where smells of spices wafted from the stalls, voices echoed from tin ceilings, and cheeky kids grabbed our hands as we squeezed through throngs of people. A typical African market, the stalls sold everything from colourful cosmetics to fresh veg but it’s tinged with the sadness of Ebola. We met women who’d lost children to the disease but had become caregivers for orphans who’d lost their parents. With Street Child grants, they’d set up market businesses, enabling them to send their children and orphans to school with the profits. Back in Makeni, it was still dark at 5am when runners gathered at Wusum Stadium. We were a mixed bunch, comprised of locals and internationals, young and old, experienced marathon runners and first-timers. But those of us who’d been to the projects shared one thing in common: a deeper connection to the cause, the country and the warm, resilient people we’d met. 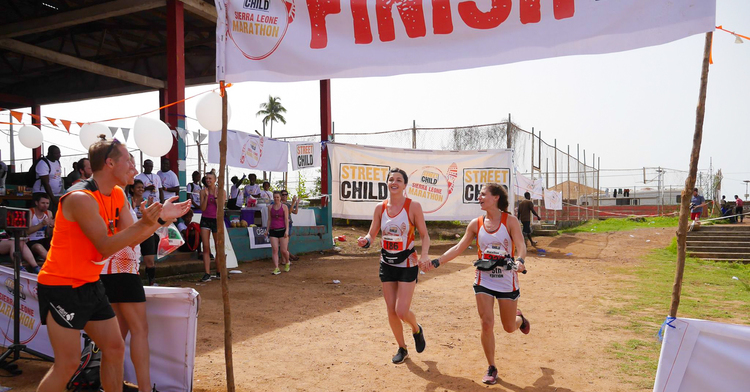 We were now running this marathon for all of them, not just for a charity called Street Child. At 6am, the half and full marathon contenders moved to the start, anxious, excited, and whooping loudly as the whistle blew. Their route would take them through the town, then into countryside villages and around the undulating jungle-clad hills that make this region so beautiful. My 10km run set off with the 5km at 7.20am with 358 participants. I was soon overtaken by a snake of white T-shirts and lean muscular legs moving far faster than mine, dodging puddles as they pounded the roads. 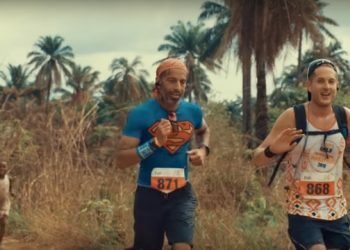 The 10km run was two laps of the 5km circuit through Makeni, passing mud-brick houses, small shops and stalls, schools, churches and mosques. My first lap flew by as I chatted to an expat teacher and a single-leg amputee running on crutches, a war victim whose strength — both physical and mental — was humbling. When they turned off to finish their 5km race, I suddenly felt alone; but the cheering crowds spurred me on. Eventually, the stadium came into view, hip-hop boomed from the speakers, and roars and applause greeted me as I crossed the finishing line, utterly elated, in one hour and one minute.